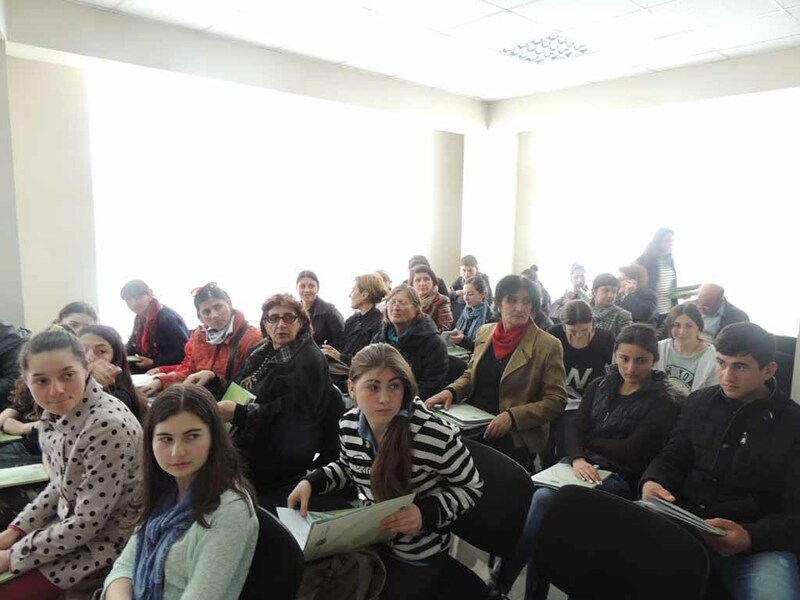 On April 15, 2014, in the framework of the project “Clean Up Georgia – Raising of Public Awareness and Involvement in Solid Waste Management Improvement ” (Phase II), Georgian Society of Nature Explorers “Orchis” arranged a Meeting in Borjomi Municipality with the participation of the representatives of Borjomi Municipality Sakrebulo and Gamgeoba, Local Authorities, LTDs, NGOs and others. On April 12, 2014, within the framework of the "Clean-up Georgia" campaign, Clean up action took place in village Kulishkari of Zugdidi municipality. Event was organized by the regional coordinator of Greens Movement of Georgia / Friends of the Earth – Georgia, where Acting Gamgebeli- Mr. Gizo Sartania has also participated. Clean up actions will be carried out in various villages of Zugdidi municipality. On April 12, 2014, within the framework of the "Clean-up Georgia" campaign Clean up actions were held in Mestia municipality. Event has been organized by the regional coordinator of Greens Movement of Georgia / Friends of the Earth – Georgia along with Supervision Service of Mestia Municipality. During the campaign, the main entrance of the municipality, neighboring areas to Saint Nino church and the main road to the airport were cleaned up. 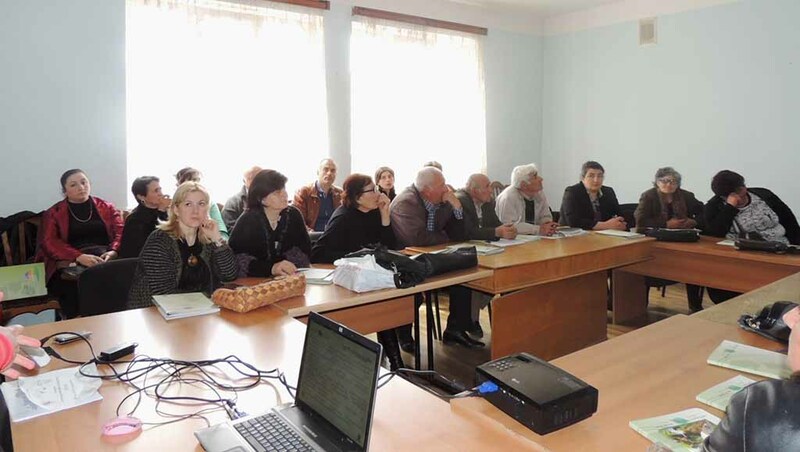 On April 10 and 11, 2014, in the framework of the project ‘Clean Up Georgia – Raising of Public Awareness and Involvement in Solid Waste Management Improvement’ (Phase II), were arranged the meetings with the teachers of Akhaltsikhe and Adigeni Municipalities schools by ECOVISION – The Union for Sustainable Development. The aim of the meetings was to raise public awareness of teachers in the field of solid domestic waste management. The teachers were provided with comprehensive information about the latest technologies and best practices of sustainable waste management. There was also a discussion on issues related to waste problems in schools. On April 11, 2014, in the framework of the project “Clean Up Georgia – Raising of Public Awareness and Involvement in Solid Waste Management Improvement” (Phase II), Greens movement of Georgia/ Friends of the Earth Georgia held a meeting in Marneuli municipality, village Qazilajli, with participation of the representatives of local population . An information package on waste management related issues has been distributed among the participants. The aim of the meeting was to address priority issues with regards of waste management in rural areas. Participants received information about the global waste management practices, as well as waste management practices in Georgia. Number of participants - 21 people. On April 11, 2014, in the framework of the project “Clean Up Georgia – Raising of Public Awareness and Involvement in Solid Waste Management Improvement” (Phase II), Greens movement of Georgia/ Friends of the Earth Georgia held a meeting in Marneuli municipality, village Tsereteli, with the participation of the representatives of local population . An information package on waste management related issues has been distributed among the participants. The aim of the meeting was to address priority issues with regards of waste management in rural areas. Participants received information about the global waste management practices, as well as waste management practices in Georgia. The meeting was attended by Tsereteli village trustee and residents from villages Saimerlo, Mirzovka and Norgiuli. Number of participants - 22 local residents. On April 10, 2014, in the framework of the project “Clean Up Georgia – Raising of Public Awareness and Involvement in Solid Waste Management Improvement” (Phase II), Greens movement of Georgia/ Friends of the Earth Georgia held a meeting in Tetritskaro municipality, village Koda, with participation of the representatives of local population . An information package on waste management related issues has been distributed among the participants. The aim of the meeting was to address priority issues with regards of waste management in rural areas. Participants received information about the global waste management practices, as well as waste management practices in Georgia. Number of participants - 17 local residents. 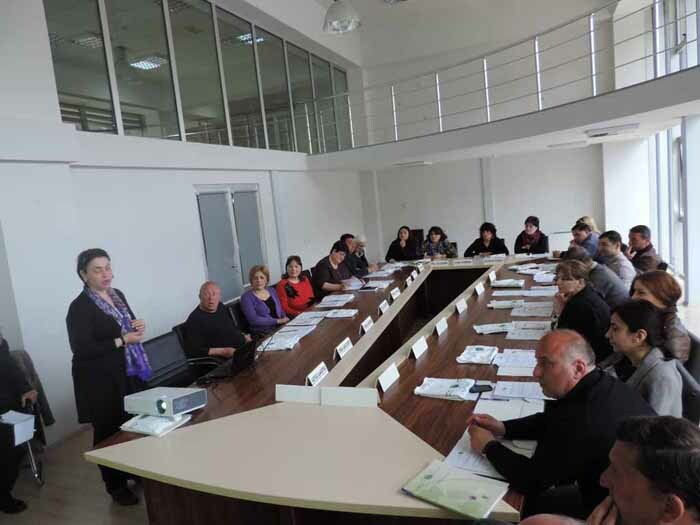 On April 10, 2014, in the framework of the project “Clean Up Georgia – Raising of Public Awareness and Involvement in Solid Waste Management Improvement” (Phase II), Greens movement of Georgia/ Friends of the Earth Georgia held a meeting in Tetritskaro municipality, village Asureti, with participation of the representatives of local population . An information package on waste management related issues has been distributed among the participants. The aim of the meeting was to address priority issues with regards of waste management in rural areas. Participants received information about the global waste management practices, as well as waste management practices in Georgia. Number of participants - 17 people. On April 8, 2014, as a part of a “Clean up Georgia ” campaign, clean up action was carried out in Chkorotsku municipality. The event was organized by the regional coordinator of Greens movement of Georgia/Friends of the Earth – Georgia. During the action, the surrounding areas of the local market have been cleaned up, with participation of Acting Gamgebeli of Chkorotsku municipality, together with representatives of local administration and the city Council, and pupils of N1 and N2 public schools. 2014-04-08 Meeting in town Rustavi within the framework of the Project "Clean up Georgia"
On April 8, 2014, in the framework of the project “Clean Up Georgia – Raising of Public Awareness and Involvement in Solid Waste Management Improvement” (Phase II), Greens movement of Georgia/ Friends of the Earth Georgia held a meeting in town Rustavi, with participation of local population. 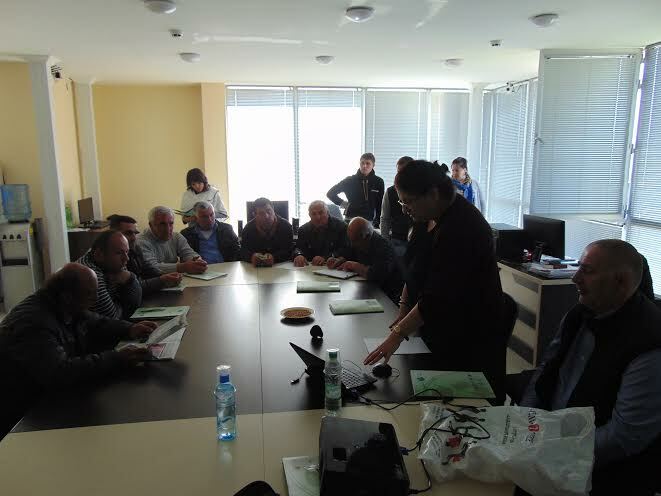 On April 7, 2014, in the framework of the project “Clean Up Georgia – Raising of Public Awareness and Involvement in Solid Waste Management Improvement” (Phase II), Greens movement of Georgia/ Friends of the Earth Georgia held a meeting in Gardabani municipality, village Norio, with the participation of the representatives of local population . An information package on waste management related issues has been distributed among the participants. The aim of the meeting was to address priority issues with regards of waste management in rural areas. Participants received information about the global waste management practices, as well as waste management practices in Georgia. Number of participants - 23 people. On April 7, 2014, in the framework of the project “Clean Up Georgia – Raising of Public Awareness and Involvement in Solid Waste Management Improvement” (Phase II), Greens movement of Georgia/ Friends of the Earth Georgia held a meeting in Gardabani municipality, village Martkopii, with the participation of the representatives of local population . An information package on waste management related issues has been distributed among the participants. The aim of the meeting was to address priority issues with regards of waste management in rural areas. Participants received information about the global waste management practices, as well as waste management practices in Georgia. In total 14 local people. On April 4, 2014, in the framework of the project “Clean Up Georgia – Raising of Public Awareness and Involvement in Solid Waste Management Improvement ” (Phase II), Georgian Society of Nature Explorers “Orchis” arranged a Meeting in Adigeni Municipality with the participation of the representatives of Adigeni Municipality Sakrebulo and Gamgeoba, Local Authorities and others. 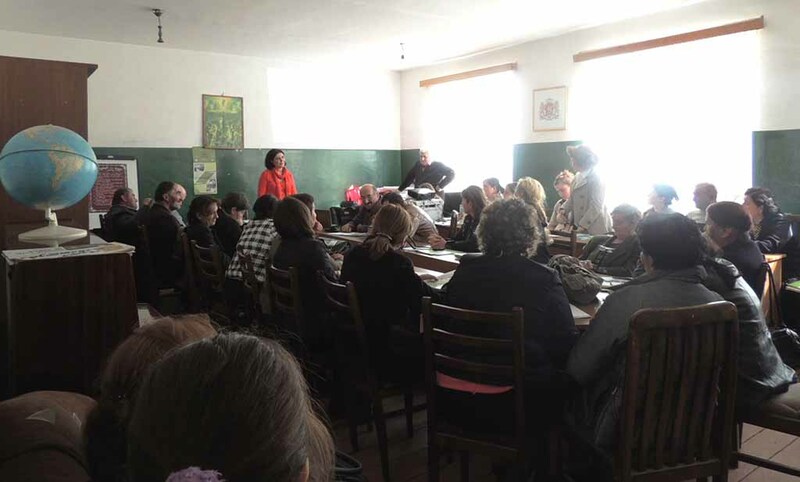 On March 28, 2014, in the framework of the project “Clean Up Georgia – Raising of Public Awareness and Involvement in Solid Waste Management Improvement” (Phase II), was arranged the meeting with the teachers of Sagarejo Municipality schools by ECOVISION – The Union for Sustainable Development. The aim of the meeting was to raise public awareness of teachers and students in the field of solid domestic waste management. The teachers and students were provided with comprehensive information about the latest technologies and best practices of sustainable waste management. There was also a discussion on issues related to waste problems in schools.